A protocol for the colloidal synthesis of silver nanocubes and fabrication of plasmonic nanoscale patch antennas with sub-10 nm gaps is presented. Hoang, T. B., Huang, J., Mikkelsen, M. H. Colloidal Synthesis of Nanopatch Antennas for Applications in Plasmonics and Nanophotonics. J. Vis. Exp. (111), e53876, doi:10.3791/53876 (2016). We present a method for colloidal synthesis of silver nanocubes and the use of these in combination with a smooth gold film, to fabricate plasmonic nanoscale patch antennas. This includes a detailed procedure for the fabrication of thin films with a well-controlled thickness over macroscopic areas using layer-by-layer deposition of polyelectrolyte polymers, namely poly(allylamine) hydrochloride (PAH) and polystyrene sulfonate (PSS). These polyelectrolyte spacer layers serve as a dielectric gap in between silver nanocubes and a gold film. By controlling the size of the nanocubes or the gap thickness, the plasmon resonance can be tuned from about 500 nm to 700 nm. Next, we demonstrate how to incorporate organic sulfo-cyanine5 carboxylic acid (Cy5) dye molecules into the dielectric polymer gap region of the nanopatch antennas. Finally, we show greatly enhanced fluorescence of the Cy5 dyes by spectrally matching the plasmon resonance with the excitation energy and the Cy5 absorption peak. The method presented here enables the fabrication of plasmonic nanopatch antennas with well-controlled dimensions utilizing colloidal synthesis and a layer-by-layer dip-coating process with the potential for low cost and large-scale production. These nanopatch antennas hold great promise for practical applications, for example in sensing, ultrafast optoelectronic devices and for high-efficiency photodetectors. In recent years, colloidal synthesis of nanoparticles and the assembly of these into advanced structures have attracted great interests both in research and industrial developments.1-4 Colloidal synthesis of nanoparticles have several advantages over lithographically fabricated nanostructures including superior size homogeneity, low cost and the possibility of large-scale, parallel production. Here, we demonstrate a procedure to synthesize Ag nanocubes and more importantly, to couple these Ag nanocubes with an underlying Au film in order to form plasmonic nanopatch antennas. The distance between Ag nanocubes and the Au film can be controlled with ~1 nm resolution by using a series of polyelectrolyte spacer layers. We also demonstrate how to incorporate an active medium, such as an organic dye, into the plasmonic nanopatch antennas. Due to the strongly confined electromagnetic fields in the gap region between the nanocubes and the Au film, the nanopatch antennas can be used for highly enhanced fluorescence and spontaneous emission of the embedded dye molecules.12,13 The methods presented in this paper can be generalized to other emitters, such as colloidal solid-state quantum dots14 or two-dimensional semiconductor materials,15 and the plasmon resonance can be tuned over a wide spectral range by varying the size of the nanocubes or the gap. Caution: Several chemicals (such as concentrated nitric acid (15.698 M HNO3) and hydrochloric acid (6 M HCl)) used in these procedures are hazardous. Proper gloves, eye protection and other safety equipment must be used. Please refer to the materials safety datasheets (MSDS) of all chemicals before use. Note: Ethylene glycol (EG) must be anhydrous. Close the EG container's cap whenever it is not used to prevent water absorption. Silver trifluoroacetate (AgC2F3O2) is very sensitive to light therefore the AgC2F3O2 solution is prepared in the last step. Prepare 1.3 mM sodium hydrosulfide hydrate (NaSH) solution by dissolving 1 mg of NaSH in 13.5 ml of EG. Prepare 20 mg/ml poly vinylpyrrolidone (PVP) solution by dissolving 0.1 g of PVP in 5 ml of EG. Prepare 3 mM hydrochloric solution by mixing 2.5 µl of 6.0 M liquid HCl solution with 4.9975 ml of EG. Prepare AgC2F3O2 solution by dissolving 0.1 g of AgC2F3O2 in 0.8 ml of EG. Clean the round-bottom flask (RBF) and its cap with concentrated (70%, 15.698 M) nitric acid HNO3. Fill the RBF with HNO3 and put the cap on for 30 min. Ensure the cap touches the acid. After HNO3 acid, clean the RBF and cap again with clean de-ionized (DI) water. Use clean nitrogen gas to dry the RBF and cap afterwards. The RBF and its cap must be clean and dry. Clean a magnetic stirring bar by immersing it in HNO3 for 30 min. After HNO3, clean it again with DI water and dry it with clean nitrogen gas. Prepare a heating bath. Place a silicone fluid bath (shown in Figure 1A) on top of a stirring hotplate with a well-controlled temperature. Use an external thermometer to monitor the fluid bath temperature. Set the temperature to 150 °C and the stirring speed to 260 rpm. Mount the RBF with a clamp as shown in Figure 1B. Place the magnetic stirring bar (prepared in step 1.2.3) into the RBF. Dip the RBF into the heating bath (approximately 10 mm deep into the liquid; see Figures 1A-1B). Use a micropipette to place 10 ml of EG solution into the RBF. Put the cap on the RBF and wait for 20 min. The purpose of this step is to clean the RBF again, this time with EG. After 20 min, remove the cap and then lift the RBF out of the heating bath, pour the 10 ml of EG into a disposal container. Note: The EG solution is hot (150 °C) and it is recommended to take the entire clamp out (Figure 1B). Make sure that the magnetic stirring bar (see step 1.2.5) does not fall off. Put the RBF back into the heating bath (see step 1.3.1). Use a micropipette to place 5 ml of EG into the RBF and put the cap on. Take the RBF's cap off, use a micropipette to place 60 µl of NaSH (as prepared in step 1.1.1 above) into the RBF. Put the cap back on. Take the RBR's cap off, use a micropipette to place 500 µl of the HCl solution (as prepared in step 1.1.3 above) into the RBF. Immediately after the previous step, use a micropipette to place 1.25 ml of the PVP solution (as prepared in step 1.1.2 above) into the RBF. Put the cap back on. Take the RBF's cap off, use a micropipette to place 400 µl of the AgC2F3O2 solution (as prepared in step 1.1.4 above) into the RBF. Put the cap back on. Wait for 2.5 hr. Ag nanocubes are forming during this step. If possible, during this time, reduce the room light to a minimum. After 2.5 hr, turn the heater off but leave the stirring on to avoid the fluid burning on the bottom. Use the clamp (shown in Figure 1B) to raise the RBF above the heating bath. Remove the cap. Remove the RBF from the heating bath such that it will cool off faster. After ~20 min, add 5 ml of acetone into the RBF. Vortex it in order to mix the solutions well. In the end, the total volume of the solution is 12 ml. See Figure 2A. Use a micropipette and transfer the final solution to eight smaller 1.5 ml plastic tubes. Centrifuge these eight tubes at a speed of 5150 x g for 10 min. As a result, all the Ag nanocubes will be at the bottom of the tubes. Use a micropipette to remove the top supernatant, leaving ~100 µl at the bottom of each tube. Fill 1 ml of DI water into each of these tubes (obtained from step 1.3.17). Vortex and sonicate (5 min) the tubes. Nanocubes are now suspended in mainly DI water. Centrifuge again the eight tubes prepared in step 1.3.18 at 5,150 x g for 5 min. All the Ag nanocubes will be at the bottom of the tubes. Use a micropipette to remove the top supernatant, leaving around 100 µl at the bottom of each tube. Fill 1 ml of DI water into each of the tubes obtained from step 1.3.19. Vortex and sonicate the tubes. Nanocubes are now suspended in DI water. The final nanocube solution obtained from this synthesis is shown in Figure 2B as an example. Vent the chamber, by pressing "Auto Vent". Open chamber door and load substrates in the dome. Close the door and pump down by pressing "Auto Pump", it takes approximately 1 hr for the chamber to pump down until the pressure is below 5×10-6 Torr. Edit the recipe. Layer#1: Cr, thickness: 5 nm, deposition rate: 1 Å/sec; layer#2: Au, thickness: 50 nm, deposition rate: 2 Å/sec. Upon reaching the desired vacuum level, the deposition process of the first metal will automatically start by pressing "Auto Run". Note: During the deposition, the high voltage module is turned on and the voltage is 10 kV. Gun rotation module is turned on, and fixture rotation is 20 rpm. After the first layer finishes, the system will automatically move to the pocket location of the second metal and start deposition. After the entire process is complete, press "Auto Vent" to vent the chamber and take the sample out. Note: The total thickness of the Au film was 50 nm and the surface roughness was measured using an atomic force microscope (AFM) yielding a typical root mean square (RMS) of 0.7 nm. No special treatment was performed of the purchased glass substrates before Au film deposition. For the sodium chloride (NaCl) solution, mix 29 g of NaCl powder with 500 ml of DI water. For the polystyrene sulfonate (PSS) solution, mix 29 g of NaCl powder with 500 ml of DI water then add 1.5 ml of the PSS stock solution. For the poly(allylamine) hydrochloride (PAH) solution, mix 29 g of NaCl powder with 500 ml of DI water then add 132 mg of PAH. Note: PAH is slightly positively charged while PSS is slightly negatively charged. As the Au film fabricated in Section 2 above is slightly negatively charged, a PAH layer will be deposited first. The steps below will demonstrate in details how to deposit five PE layers: PAH/PSS/PAH/PSS/PAH. First, deposit a PAH layer by immersing the gold film (fabricated in Section 2 above) into a PAH solution (prepared in step 3.1.3) for 5 min. This results in a PAH layer on top of the Au film with a thickness of ~1 nm. After 5 min, rinse the Au film + 1 PAH layer with clean DI water. 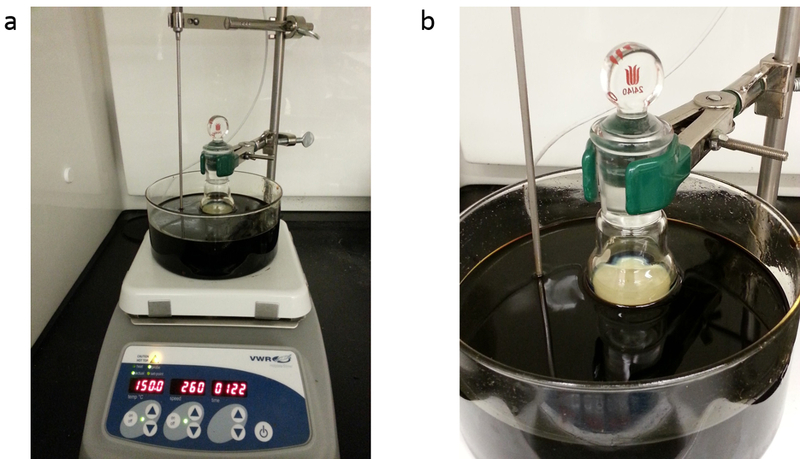 Immerse the Au film + 1 PAH layer into a NaCl solution (prepared in step 3.1.1) for 1 min. Immerse the Au film + 1 PAH layer (after step 3.2.3) into a PSS solution for 5 min. This results in a PSS layer with a thickness of ~1 nm on top of the PAH layer. After 5 min, rinse the Au film + 1 PAH layer +1 PSS layer with clean DI water. 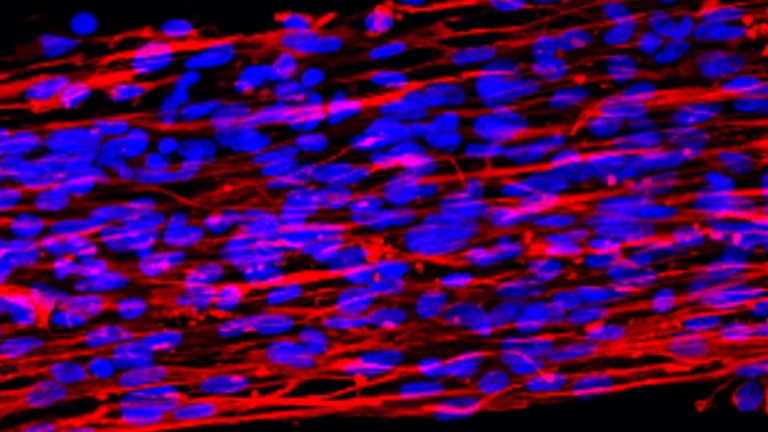 Immerse the Au film + 1 PAH layer + 1 PSS layer into the NaCl solution for 1 min. Immerse the Au film + 1 PAH layer + 1 PSS layer into the PAH solution for 5 min. This results in another PAH layer with a thickness of ~1 nm on top of the PSS layer (prepared in step 3.2.4 above). After 5 min, rinse the Au film + 1 PAH +1 PSS + 1 PAH layers with clean DI water. Immerse the Au film + 1 PAH + 1 PSS + 1 PAH layers into the NaCl solution for 1 min. Immerse the Au film + 1 PAH + 1 PSS + 1 PAH layers into the PAH solution for 5 min. This results in a second PSS layer with a thickness of ~1 nm on top of the PAH layer (which was prepared in step 3.2.7 above). After 5 min, rinse the Au film + 1 PAH +1 PSS + 1 PAH + 1 PSS layers with clean DI water. Immerse the Au film + 1 PAH + 1 PSS + 1 PAH +1 PSS layers into the NaCl solution for 1 min. Immerse the Au film + 1 PAH + 1 PSS + 1 PAH +1 PSS layers into the PAH solution for 5 min. This results in another PAH layer with a thickness of ~1 nm on top of the PSS layer (which was prepared in step 3.2.10 above). Finally, rinse the Au film + 1 PAH + 1 PSS + 1 PAH +1 PSS + 1 PAH with DI water and dry the sample using clean nitrogen gas. Note: The total thickness of the five PE layers was measured in air using a spectroscopic ellipsometer at incidence angles of 65°, 70°, and 75°, yielding a thickness of 5.0 ± 0.1 nm. Prepare a 25 µM Cy5 solution with DI water as the solvent. Expose the surface of the sample (which has a series of five PE layers, as described in Section 3 above) to 100 µl of a 25 µM Cy5 solution for 10 min. First drop cast 100 µl of the Cy5 solution (prepared in step 4.1) onto the sample surface and then place a cover slip on top of the solution drop. Cy5 molecules will incorporate into the top PE layers uniformly. After 10 min, rinse the sample with DI water and dry it with clean nitrogen gas. Dilute the nanocube solution obtained from Section 1 by a factor of 1/100 using DI water to enable the optical study of individual NPAs. Use a micropipette to place a drop of 20 µl of diluted nanocube solution (prepared in step 5.1) onto a clean cover slip. Place the sample (prepared in Section 4) in contact with the cover slip for 2 min. This results in the Ag nanocubes to be immobilized on the top terminal PAH layer because the nanocubes synthesized here are negatively charged and the top PAH layer is positively charged. After 2 min, rinse the sample with DI water and dry with clean nitrogen gas. Note: Steps 5.1 - 5.3 describe a procedure to prepare a sample for optical studies of single NPAs using a dark field microscope (dark field scattering). To prepare a sample for reflectivity measurements, a similar procedure is applied except that in step 5.1 the original nanocube solution is diluted by a factor of 1/10 instead of 1/100. Note: A custom built optical bright-/dark-field microscope is used in these measurements. The NPAs are illuminated by a white light source through a long working distance bright-/dark-field objective. The reflected/scattered light from the NPAs is collected by the same objective. A pinhole aperture (50 μm diameter) is used at an image plane to select signal from an individual nanoantenna. A digital camera is used to capture a color image. A spectrometer and a charge coupled device (CCD) camera are used to acquire spectral data. For fluorescence measurements, a 633 nm continuous wave HeNe laser is used for excitation and the signal was spectrally filtered by a long pass filter. Under white light illumination, identify single NPAs on the sample that was prepared in Section 5. Under white light illumination, individual NPAs appear as bright, red or pink colored dots as shown in Figure 4C. Align a single NPA with the pinhole aperture using a translation stage. Ensure that the dark field scattering image of the NPA is still observed after the pinhole aperture. Acquire a spectrum of the scattered light from the NPA using the spectrometer and CCD camera with a 1 sec integration time. Because the aperture area (50 µm) is much bigger than the physical size of the NPA (~ 75 nm) the spectrum contains scattered light from the NPA in addition to signal from the area surrounding the NPA. Move the sample to an area without any NPAs and acquire another spectrum with a 1 s integration time. This spectrum represents scattered light from the background. Remove the sample with NPAs and place a certified reflectance standard sample in the setup. Acquire a spectrum of the scattered light with a 0.1 sec integration time in order to normalize the signal from the NPA. Close the pinhole aperture and acquire a spectrum with a 0.1 sec integration time without any input signal. This spectrum represents the CCD dark counts. where INPA+background, Ibackground, Iwhite light, ICCD dark are the scattering spectra measured by steps 6.1.3, 6.1.4, 6.1.5 and 6.1.6, respectively. Under white light illumination, identify single NPAs from the sample prepared in Section 5. In dark field, individual NPAs appear as bright, red or pink colored dots as shown in Figure 4C. Align a single NPA with the pinhole aperture using a translation stage. Ensure that the dark field scattering image of the NPA is detected by the camera placed after the pinhole aperture. Turn off the white light illumination and turn on the 633 nm continuous wave HeNe laser used for excitation. Place a 633 nm long pass laser filter in the optical path right before the entrance to the spectrometer in order to block any scattered laser light. Acquire a fluorescence spectrum of the emission from the Cy5 molecules using a 1 sec integration time. Because the aperture area (50 µm) is much larger than the physical size of the NPA (~ 75 nm) this spectrum contains emission from both molecules embedded in the NPA as well as molecules surrounding the NPA. Move the sample to an area without any NPAs and acquire another spectrum with a 1 sec integration time. This spectrum represents the emission from molecules in the background, without any NPAs. Prepare a separate sample, which will be used as a control sample, following the procedure in Sections 3 and 4 where Cy5 molecules are incorporated with PE layers on top of a glass slide (without a Au film and Ag nanocubes). Acquire a fluorescence spectrum of the emission from Cy5 molecules on the control sample prepared in the previous step using a 10 sec integration time. Here, we show representative results of the characteristics of the plasmonic nanopatch antennas, including SEM images of the sample structure, a reflectivity spectrum of a collection of nanopatch antennas and a scattering spectrum from a single nanopatch antenna. The energy of the plasmon resonance of the nanopatch antennas depends on the size of the nanocubes, the thickness of the dielectric gap region, i.e., the number of PE layers, as well as the dielectric material. In the procedure presented above we obtained Ag nanocubes with an average side length of 75 nm and slightly rounded corners (radius of curvature ~10 nm) coated in a PVP layer with an estimated thickness of 1-3 nm. In combination with the 5 PE layers and gold film, this result in a plasmon resonance centered at ~650 nm with a full-width-at-half-maximum (FWHM) of ~50 nm. This in turn has good spectral overlap with the absorption and emission wavelength of the Cy5 molecules which is centered at 646 and 662 nm, respectively. Figure 3A shows a SEM image of a sample with a high concentration of nanocubes. These nanocubes were deposited on top of a Au film with 5 PE layers. Such SEM images are used to verify the overall quality of the nanocube synthesis; however, these samples are not utilized for further optical measurements as the density of the nanocubes is too high. Additionally, due to the high density, some nanocubes do not lie on the surface which is essential to form the plasmonic nanopatch antenna structure. Figure 3B shows a SEM image of a sample of nanocubes fabricated using a nanocube solution which has been diluted by a factor of 1/10. This sample is used for measurements where the reflectivity of white light from an ensemble of nanopatch antennas was measured to determine the overall plasmon resonance. Figure 3C shows a SEM image of a sample of nanocubes fabricated using a nanocube solution which has been diluted by a factor of 1/100. This sample is used for scattering measurements of an individual nanopatch antenna. Using the diluted nanocube solution enables individual nanopatch antennas to be spatially isolated at an image plane by using a small pinhole. Figure 4A shows a reflectivity spectrum, after normalization with the white light background, measured from a similar sample to the one shown in the SEM image in Figure 3B. Figure 4B shows a scattering spectrum from a single nanopatch antenna similar to the sample shown in the SEM image in Figure 3C. Figure 4C shows a dark field image of a nanopatch antenna sample (prepared by a 1/100 diluted nanocube solution dispersed on a gold film with 5 PE layers) taken by a Nikon D90 digital camera. The observed bright red dots are due to scattering of white light from individual nanopatch antennas. A few spots are observed to have colors other than red, which is a result of nanocubes with different sizes or larger nanoparticles with non-cubic shapes. Figure 4D shows two fluorescence spectra, one measured from a single nanopatch antenna (from a sample similar to the one shown in Figure 3C) and the other from a control sample consisting of a glass slide with the same number of PE layers and density of Cy5 dye molecules. The fluorescence intensity from Cy5 molecules coupled to the nanopatch antenna is much stronger than on the glass slide. This results from an enhanced excitation rate as well as a modified radiation pattern and increased quantum efficiency of the dye molecules.12 After correcting for background fluorescence and normalizing per unit area by dividing the area under the nanocube with the excitation spot size,12 we obtain an enhancement factor of ~ 12,000 from the data shown in Figure 4D. This enhancement factor is smaller compared with the previously reported value of 30,00012 likely due to the use of a Au instead of Ag film, increasing non-radiative losses. Figure 1. Equipment setup for Ag nanocube synthesis. (A) A photograph of the equipment setup showing the heating bath on top of the stirring hotplate with temperature control. (B) A close up of the round-bottom flask (RBF) containing the nanocube solution during the synthesis. The setup is located inside a fume hood with proper air ventilation. Please click here to view a larger version of this figure. Figure 2. Pictures of the nanocube solution. 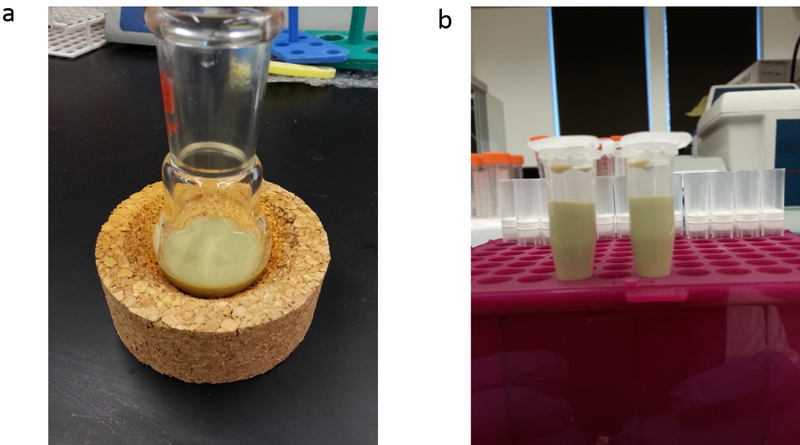 (A) Nanocube solution after the 2.5-hr synthesis and (B) after transfer to smaller tubes and re-suspended in de-ionized water. Please click here to view a larger version of this figure. Figure 3. SEM characterizations of Ag nanocubes. (A) SEM image of a concentrated nanocube sample, (B) a diluted (1/10) nanocube sample, and (C) a diluted (1/100) nanocube sample. Please click here to view a larger version of this figure. Figure 4. Optical characterizations of nanopatch antennas. (A) Normalized reflection spectrum measured from an ensemble of nanopatch antennas (non-diluted nanocube solution). (B) Scattering spectrum from a single nanopatch antenna (1/100 diluted nanocube solution). (C) A dark-field image of a nanopatch antenna sample (1/100 diluted nanocube solution) taken under white light illumination. Each bright red dot corresponds to an individual plasmonic nanopatch antenna. 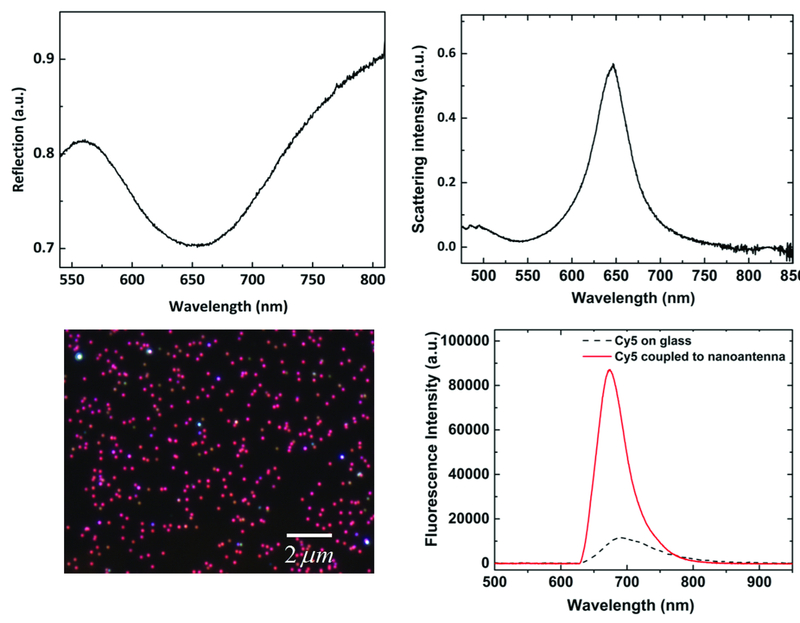 (D) Fluorescence from Cy5 dye molecules embedded in a nanopatch antenna (red solid line) compared to that from a glass slide with an identical concentration of Cy5 dyes (dashed black line). Please click here to view a larger version of this figure. The size and shape of the Ag nanocubes from the process presented in the above protocol are very sensitive to the cleaning of the RBF, its cap and the stirring bar as well as the quality of the EG solution. Nanoparticles with different shapes such as rounded or elongated nanoparticles is a sign that there is likely an issue with one of these steps in the synthesis. It is therefore advised that steps 1.1.1-1.1.4 and 1.2.1-1.2.2 are critically important. In Figure 4b the scattering spectrum collected from a single nanopatch antenna is shown which exhibits a strong plasmon resonance at 650 nm. Such a resonance indicates an excellent mode confinement in the gap region between the Ag nanocube and Au film made possible by high-quality nanocubes. Additionally, to obtain such a spectrum, it is also required that the sample is clean, the spacer layers (PE layers) have a uniform thickness and that the underlying Au film is smooth. The strong plasmon resonance is further confirmed by the data presented in Figure 4c where individual nanopatch antennas can be observed in the dark field image and in Figure 4d where large fluorescence enhancement is observed of Cy5 molecules located in the gap region. It should also be noted that the Ag nanocubes oxidize over time despite the PVP coating when exposed to air and thus it is recommended that optical measurements should be performed on the day the sample is prepared or within 1 to 3 days. To minimize oxidation, it is recommended that the nanopatch antenna samples be stored in vacuum or nitrogen gas. The method presented in this paper enables the fabrication of Ag nanocubes and plasmonic nanopatch antennas with well-controlled dimensions utilizing colloidal synthesis and a layer-by-layer dip-coating process. Compared with other techniques such as optical or electron beam lithography, the technique presented here offers the potential for low cost and large-scale production while producing a narrow size distribution of nanoparticles. Fan, J. A., et al. Self-Assembled Plasmonic Nanoparticle Clusters. Science. 328, (5982), 1135-1138 (2010). Zhang, Q., Li, W., Wen, L. -P., Chen, J., Xia, Y. Facile Synthesis of Ag Nanocubes of 30 to 70 in Edge Length with CF3COOAg as a Precursor. Chem. Eur. J. 16, (33), 10234-10239 (2010). Sun, Y., Xia, Y. Shape-Controlled Synthesis of Gold and Silver Nanoparticles. Science. 298, (5601), 2176-2179 (2002). Xia, Y., Halas, N. J. Shape-Controlled Synthesis and Surface Plasmonic Properties of Metallic Nanostructures. MRS Bull. 30, (05), 338-348 (2005). Ciraci, C., et al. Probing the Ultimate Limits of Plasmonic Enhancement. Science. 337, (6098), 1072-1074 (2012). Chandran, S. P., Chaudhary, M., Pasricha, R., Ahmad, A., Sastry, M. Synthesis of Gold Nanotriangles and Silver Nanoparticles Using Aloevera Plant Extract. Biotechnol. Prog. 22, (2), 577-583 (2006). Perez-Juste, J., Pastoriza-Santos, I., Liz-Marzán, L. M., Mulvaney, P. Gold nanorods: Synthesis, characterization and applications. Coord. Chem. Rev. 249, (17-18), 1870-1901 (2005). Nikoobakht, B., El-Sayed, M. A. Preparation and Growth Mechanism of Gold Nanorods (NRs) Using Seed-Mediated Growth Method. Chem. Mater. 15, (10), 1957-1962 (2003). Rycenga, M., et al. Controlling the Synthesis and Assembly of Silver Nanostructures for Plasmonic Applications. Chem. Rev. 111, (6), 3669-3712 (2011). Cortie, M. B., McDonagh, A. M. Synthesis and Optical Properties of Hybrid and Alloy Plasmonic Nanoparticles. Chem. Rev. 111, (6), 3713-3735 (2011). Halas, N. J., Lal, S., Chang, W. -S., Link, S., Nordlander, P. Plasmons in Strongly Coupled Metallic Nanostructures. Chem. Rev. 111, (6), 3913-3961 (2011). Rose, A., et al. Control of Radiative Processes Using Tunable Plasmonic Nanopatch Antennas. Nano Lett. 14, (8), 4797-4802 (2014). Akselrod, G. M., et al. Probing the mechanisms of large Purcell enhancement in plasmonic nanoantennas. Nature Photon. 8, (11), 835-840 (2014). Hoang, T. B., et al. Ultrafast spontaneous emission source using plasmonic nanoantennas. Nat. Commun. 6, (2015). Akselrod, G. M., et al. Leveraging Nanocavity Harmonics for Control of Optical Processes in 2D Semiconductors. Nano Lett. 15, (5), 3578-3584 (2015). Mock, J. J., Hill, R. T., Tsai, Y. -J., Chilkoti, A., Smith, D. R. Probing Dynamically Tunable Localized Surface Plasmon Resonances of Film-Coupled Nanoparticles by Evanescent Wave Excitation. Nano Lett. 12, (4), 1757-1764 (2012). Skrabalak, S. E., Au, L., Li, X., Xia, Y. Facile synthesis of Ag nanocubes and Au nanocages. Nat. Protocols. 2, (9), 2182-2190 (2007). Im, S. H., Lee, Y. T., Wiley, B., Xia, Y. Large-Scale Synthesis of Silver Nanocubes: The Role of HCl in Promoting Cube Perfection and Monodispersity. Angew. Chem. Int. Ed. 44, (14), 2154-2157 (2005). Moreau, A., et al. Controlled-reflectance surfaces with film-coupled colloidal nanoantennas. Nature. 492, (7427), 86-89 (2012). Lassiter, J. B., et al. Plasmonic Waveguide Modes of Film-Coupled Metallic Nanocubes. Nano Lett. 13, (12), 5866-5872 (2013).